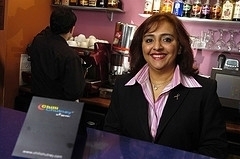 Neelofar Khan is the force of nature behind the award-winning purveyors of Halal Lahori cuisine, Chilli Chutney. How did Chilli Chutney come about? "I thought I'd start something when the children were growing up to get me focused on a project. [Neelofar has two adult children and one young one still at home.] I wanted to either run a nursery or a food oriented business. I liked the idea of a food oriented business because I like socialising. I didn't realise it's not about socialising at all. It turned into a huge commitment. So, it was more by chance and then it evolved from there." "I started the business in 2003 with a partner, but primarily it was my own investment and bank financing. Now, I run it myself. My husband has been a mentor, but he has his own business and a job and is extremely busy. We started with eight people and now have about 20 people full time. We do outdoor catering and parties and also employ temporary staff, as necessary." The Chilli Chutney restaurant in Streatham was the first location, followed by fast service outlets in Allders, Croydon, in 2007, and Waterloo in 2009 and by a tea garden, Chai Corner, also in Croydon, in 2010. Chilli Chutney has won awards and has been recognised for both its food and its corporate social responsibility. What made corporate social responsibility so important to you? "From day one, I have felt extremely passionate about putting something back into the community. I feel if we all do a little bit ourselves, the world can be a much much better place because in our own small ways we can make a huge amount of difference. Rather than be inward looking, we ought to be outward looking. I have always been involved in the community, but not to this extent. It was only after I started the business that I really got involved. I seized the opportunity when I had the visibility from the business. And this should be done because one should not just feel that one has a business that you come to and then go home and that's it. Once you open a business, help others as well. I've always championed the cause of small businesses in Lambeth Borough and in South London." Neelofar is a member of various boards, including the Lambeth Enterprise Board and The Lambeth Strategic Partnership Board and has been invited to work with the Pakistan High Commission on trade and export between the UK and Pakistan. In April 2010, Neelofar launched a programme to improve the interactions between the local business community and the UK Border Agency. Has corporate social responsibility benefited your business and your community? "Corporate social responsibility increases local prosperity, has impact on reduction of crime and on better health and increasing local employment. Everyone benefits. And yes, it has raised the profile of the business. I put in huge amounts of hours in addition to work. It is very much appreciated by the community and it gives me alot of satisfaction to help someone who is starting out, who is having difficulty." Advice for entrepreneurs who want to get involved in the community? "Talk to your local networking group and chamber of commerce group. Your local council will have access to those groups. Involvement needs to be focused locally, otherwise it just withers away. Find your local business champions and speak to them." The Chilli Chutney Restaurant is located at 20 - 21 The High Parade, Streatham High Road, London SW16 1EX, tel. 0208 696 0123. Chilli Chutney Waterloo is located opposite the London Eye at 47 York Road, London SE1 7NJ, tel. 020 7021 0202. Chilli Chutney Croydon and Chai Corner are located at Allders, 2 North End, London CR9 1SB.